A half dozen students hovered over a seven-foot by two and one-half foot touch screen, their hands sliding across the glass as if they were playing some kind of high tech table game. A swipe here, a click there and the image changed. They switched from a life-sized view of a human body to the same body's skeleton and then to its cardio-vascular system. With another click, they could bring up an image of specific organs and tissues - all in high definition 3-D. But this was no game. The students - from Indiana and Indiana State universities and Ivy Tech Community College - were using the highest of high-tech instruments to learn the intricacies of human anatomy. "We have a cadaver lab and cadavers are phenomenal at teaching us the anatomy of a person, and now to have a computer version of that is great," said Teela Crecelius of Marengo, a third-year medical student at the IU School of Medicine-Terre Haute. "I can't go back to the cadaver lab and just dissect anything, but I have the opportunity to come over here to dissect a cadaver all evening to study for my surgery rotation or to just review anatomy. It is phenomenal that we have that here in Terre Haute." The Anatomage Table is the latest addition to the Rural Health Innovation Collaborative Simulation Center that has relocated and expanded twice in the last two years. "The Anatomage shows exactly how advanced the technological abilities of the Simulation Center can be," said Jack Jaeger, a veteran critical and emergency care nurse and clinical educator who has served as the center's director for the past year. "In fact, only 10 of these tables currently exist worldwide, and the RHIC houses the only one in Indiana." The center is a collaborative partnership between Indiana State, Ivy Tech Community College-Wabash Valley, the IU School of Medicine-Terre Haute, and Union Hospital, which has provided 8,000 square feet for the facility in is former intensive care unit. The center provides opportunities in inter-professional education through simulation to a wide variety of healthcare disciplines through advanced technology and safe, life-like medical environments, Jaeger said. 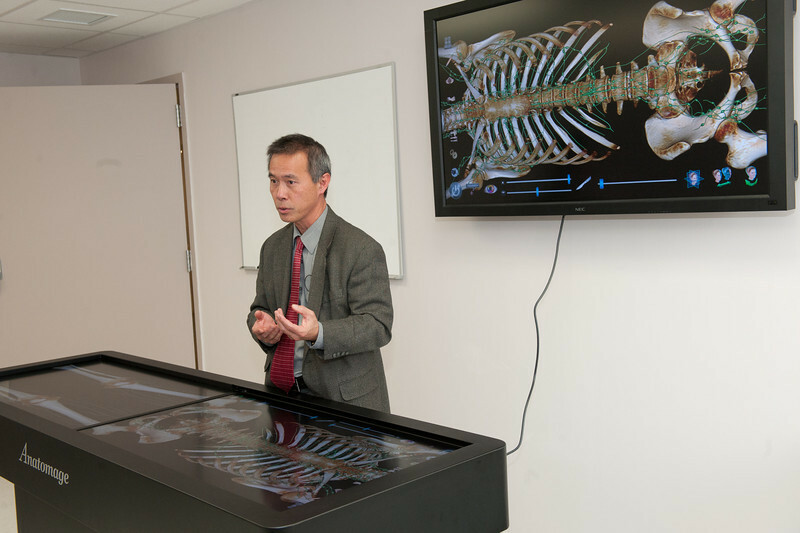 The new virtual dissection table takes advantage of the latest technological advancements in imaging, such as X-rays, ultrasound and magnetic resonance imaging, and combines them for use in an LCD screen. 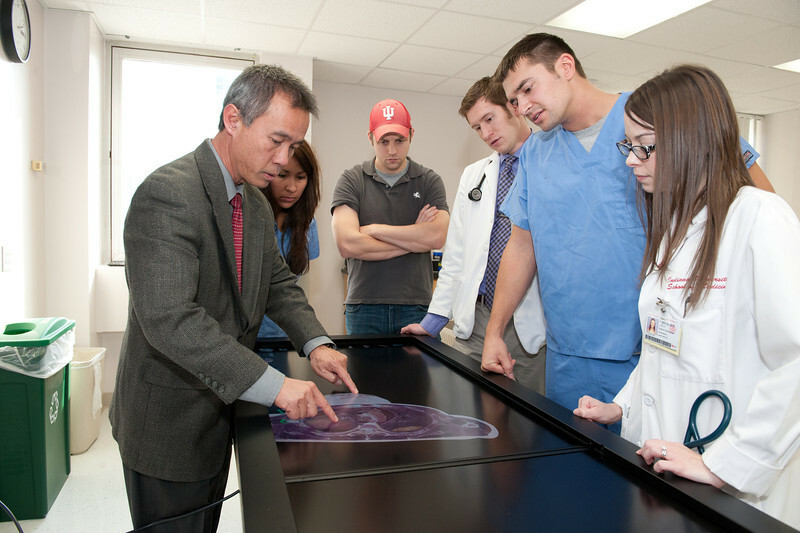 The table's touchscreen help students understand surgical procedures, review cases, or educate patients. It allows any radiology scan to be uploaded for 3D interactive visualization, as well as 3D images of medical devices, allowing manufacturers to demonstrate exactly how their product works. "This instrument is yet another example of how the center, and its partners who created it, can provide the most innovative and progressive learning opportunities in healthcare," Jaeger said. "The Anatomage Table is something we couldn't dream of even six or seven years ago. Now, along with the advances in human patient simulators and diagnostics training equipment, we have the ability of putting our students, as well as current healthcare providers, into a world that is almost as real as their ICU's, doctor's offices, and trauma scenes. Every detail is thoroughly evaluated to provide participants an experience that prepares them for the real world." The Anatomage has advantages over actual human bodies, Jaeger said, noting students can easily manipulate its touchscreen and seamlessly advance through layers of tissue and organs that would be impossible on a real cadaver. "The Anatomage Table looks a human being. The touchscreen is easy to manipulate and allows the user to seamlessly advance through layers of tissue and organs that would be impossible even on a real cadaver. It is truly remarkable." There are other advantages, noted Jordan Pothast, a second-year student in Indiana State's master's degree program in physician assistant studies. "We had the anatomist in here earlier saying that we don't have the smell as we normally would with a cadaver, so it definitely is nice" he said. "Cadavers are also not in abundance and you can't go in there (the cadaver lab) all of the time." For now, though, as sophisticated as the Anatomage is, Pothast doesn't see it totally replacing the need for cadavers. "There is no other experience like working with actual human tissues and organs and getting hands-on practice with scalpels and different tools," he said. "This (the Anatomage) is more of a supplementation right now." It's a supplementation that is very welcome, Jaeger said. Indiana University recently expanded the number of medical students it serves at its Terre Haute facility, located on the Indiana State campus, and Indiana State and Ivy Tech Community College continue to expand their health-related offerings - all in an effort to address a shortage of providers. While Indiana State and the IU Medical School-Terre Haute each have cadaver labs, the availability of cadavers nationwide has not kept pace with demand, making development of the Anatomage even more timely and significant, Jaeger said. Contact: Jack Jaeger, director, Simulation Center, Rural Health Innovation Collaborative, 812-238-4625 or jejaeger@uhhg.org. Some students from ISU, the Indiana University School of Medicine and Ivy Tech Community College have access to one of only 10 Anatomage virtual dissection tables in the world.